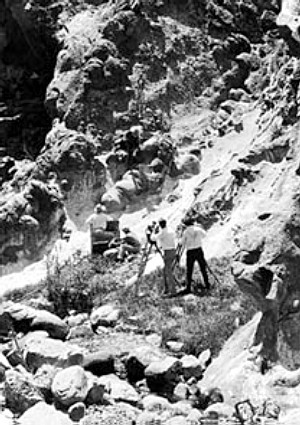 Film shoot in Towsley Canyon, 1927. From the archives of the Automobile Club of Southern California. Towsley Canyon, located just west of Interstate 5 near Newhall and south of oil-rich Pico Canyon, was explored for oil as early as the 1860s and continued to produce  though perhaps not as prolifically as Pico Canyon  well into the 20th Century. In 1995 Chevron USA sold the former Standard Oil Co. holdings to the Santa Monica Mountains Conservancy. Towsley Canyon is now a state park.